Do you use your serger sewing machine to its fullest? Are you using it for more than just clean finishing edges? To ensure you are getting the full value from your purchase, Nancy invited serging specialist, Pam Mahshie, National Baby Lock Ambassador, to be her guest on Sewing With Nancy. Pam is a magician with the serger! 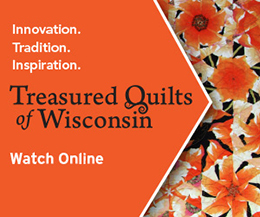 Simply watch online at Sewing With Nancy. You can’t go in reverse on your serger to lock the stitches, but you can stitch over the thread tails. Learn Pam’s clever ways to lock the thread tails at both the beginning and end of the seams. Sometimes it is difficult to serge around curved edges without getting loopy threads hanging off the edge. This technique will give you smooth results every time. Piecing a quilt top with your serger might have never crossed your mind. Yet, for simple quilt designs, the serger is a fast and accurate way to make a quilt top. Seam traditionally or . . . with decorative threads and the seams exposed. Either way, your serger can be a go-to quilting machine. Home décor, wearable art, or kids’ clothes—those are all categories where piping accents add interest and texture. With a serger, piping is easier than ever to include in a seam or along the outer edge of your next project. A blanket stitch is an ideal way to finish the edges of fleece. Why?—The stitches will always be even and the process extra easy. Learn how to add a blanket stitch with a 3-thread flatlock setting. Several seasons ago, Pam and Nancy presented a three-part Sewing With Nancy series simply called the Serger Workshop. The Ultimate Serger Techniques Workbook and DVD is a spiral bound book with DVD that combines the information from this series. Learn 33 techniques using 10 different serger stitches! Now is your chance to win this workbook and DVD from Nancy’s Notions by leaving a comment telling us a serger technique you’d like to try. One winner will be selected randomly. The randomly selected winner of Eileen Roche’s book, Machine Embroidery in 6 Easy Lessons from Designs in Machine Embroidery is Gail K.
Her comment is: Proper hooping: selecting the best stabilizer for the fabric & design and then trying to get it lined up & hooped without blood, sweat, and tears. Funny, but oh so very true! Would Love to use my Serger for quilting. Most of all I would like to learn more about the decorative stitches with different types of thread but anything would be of great value to me. Thanks for the opportunity! I’d love to try the finishing technique which looks like a blanket stitch, because my regular sewing machine does not do one. Have been thinking about firing up my serger that I last used to make diaper-cover liners and nursing pads when a grand-daughter was born…8 years ago! The idea of adding piping to accesories and garments with my serger intrigues me! I would love to learn to use the serger that I have never even turned on! I would love to use my serger with confidence and not be afraid of it. This workbook and DVD would be so helpful. I’d love to learn how to do decorative stitches with my serger. I’d love to do a hem with a cover stitch confidently. I’ve been scared to try. Have had my serger for a long time but there are still so many things I would like to learn to make better use of it. I can’t pick just one. I would love to learn how to add piping to a garment and also I want to learn how to do a blanket stitch with my serger. I would love to be able to learn many ways to use the flatlock stitch. I have had my serger for a long time but only use the serger stitch and the hem stitch. would like to use all of the stitches. I think Nancy’s Serger Book would tech me a lot. I’d love to learn how to insert piping with a server. Seriously, I need help to learn the proper way for all the stitches but I really have had an awful time doing curves. I have tried it “my” way… not pretty. I will watch the program and glean what I can. Thank you! I’d love to try my hand a piecing a quilt top with my Baby Lock Evolution serger . I’m interiores by the idea of exposed serger seams with decorative threads. The possibilities are endless. My Evolution is at the least my third BL serger. I have loved each and every one of them. Yet, I know it has so much more potential than I have used so far – the book and CD would be a wonderful help to delve even further into the many possibilities awaiting me. Love my serger, would like to learn the flatlock blanket stitch. Quilting and the blanket stitch!! I want to learn how to add a blanket stitch to fleece. I think they would make great gifts. Just retired and bought a baby lock serger machine. I know there are so many things I need to learn concerning the serger. I can’t wait! I’m not even sure of all the stitches it will make. I would love to get the DVD and book to learn how to use my new machine! Met Nancy and Pam at a retreat when I bought my BL serger. Wonderful teachers! I would love to learn serger zipper techniques and piping! Love my Babylock! I have used my serger for some of the customary projects, but since I am recently branching out into some Quilting–would like to incorporate it in combining some designs or patterns for quilt tops. I like the idea of the flat stitch, etc with some that I have in mind!! I really want to learn how to better “finish” things like thread tails, so they don’t unravel, and also sewing around curves, beginning and ending a circle of fabric. A serger is a useful machine but more so if the user is familiar with the techniques outlined in the Ultimate Serger Workbook And DVD. I have a Babylock Evolve that became all unthreaded when I moved. I would love to get it back in working order so I can try some of the wonderful stitches it is capable of doing. The workbook and DVD sound like just what I need. Having a Baby Lock is a dream! Learning how to use it to it’s fullest potential would be wonderful!! Pam is a patient instructor. I have a Bernina Serger that I don’t use because I have never yet felt comfortable with it and just haven’t been able to get the hang of the machine. I would love to be able to really use this machine along with my new Embroidery machine that I haven’t mastered yet. I guess I just need to stop making quilts for a while and sit down and work with these two machines. I bought a serger for clothing construction. I know there are so many more uses for my serger but I have no idea where to begin and have some trepidation. This book would get me going. I want to do cover stitch well. I would like to learn how to use decorative threads with my serger. I have an unused serger: looks like I need to try all the techniques to know what I can do with it! I’d like to learn how to do piping with my serger. I would like to try the blanket stitch to edge scarfs for fall and winter. I do not have a serger, but my mother does and I have used it a few times, a little scary at first! I would love to try all the different stitches. I think this book would help a lot but the DVD even more, because I am more of a visual leaner. The blanket stitch looks like it would be fun to try! I would love to learn how to piece a quilt top with my serger. Unfortunately I don’t use my serger very often and this workbook would help me expand my serging techniques. Thanks for the fantastic giveaway! I would love to learn how to do the piping with my serger as I am making new pillows for the Holidays. The Serger workbook and CD would help me to use my serger more on a daily basis. Thank you for making such a wonderful offer! I have a serger but have been terrified of threading it from scratch. I would love to be able to access all of its versatility! Just bought myself a new serger. It is very intimidating! I would like to learn how to end a coverstitch hem, like a sleeve hem. I’m not having much luck with that. I would love to learn how to install a zipper and use beading foot. I would like to learn how to do corners and curves. I really like my 20 plus year old serger. An asset to my sewing. I would like to learn how to do the blanket stitch. I have said often that I would be lost without my serger! However, I use it mostly for regular construction seams of garments and the cover stitch for knits. It is so wonderful for all Knits! I recently up-graded to a Baby Lock Evolution and would like to put it to more use like the wave stitch and other decorative stitches and decorative threads. A workbook would be so helpful. Thanks! The serger has so much to offer. Would be a good book to have in your library. I didn’t know you could do a blanket stitch on the serger. I would like to learn that – plus all the other techniques included in the book. Using a serger is different than using a regular sewing machine. I would like to learn to do a blanket stitch with my serger. I have just learn how to do some of the simple things. This book seems like a treasure trove of techniques for using a serger beyond finishing seams! There is so much I’d love to learn about my serger–what the differential is all about, how to sew curves, decorative stitches like The Wave, what stitch to use with knits, the purpose of the flatlock stitch… I could learn so much from such a book!! I am fascinated that you can do a blanket stitch on a serger Can wait to try this technique! If this book could help me understand and use my serger, it would surely be a blessing! Thank you for the opportunity. This video from Nancy is so educating and a joy to watch. It reinforces my to need practice and to start sewing with my serger again. Thanks for the opportunity to win this book. I was given a serger, but have never used one before so I need to learn it all. This book and DVD would help me learn it. Thank you for this opportunity. Now that I have grand kids I would like to do more decorative surging like ruffles and piping. This book would be wonderful reminders of the set up. I am excited about locking the end threads in place. I would also like to have smooth curves. I love my serger, but doing more with it is always a plus!!! I’ve got a serger I seldom use because no just don’t know how and the instruction manual assumes a level of knowledge I just don’t possess! I’ve got a server I seldom use because no just don’t know how and the instruction manual assumes a level of knowledge I just don’t possess! I am looking to update my serger. The Babylock sergers are amazing machines. No longer just a seam neatener. The latest sergers can do so much more. A good book to show these techniques would be the best way to thoroughly get to know the machine. I’d love to be able to make smooth curves. I could not believe I have been using my BL serger for 15 years and never new how to start and end a seam so cleanly! The next technique I really need to try is that fleece blanket edge. I NEED this book!! I have a serger, but I’m scared of it. All the techniques would be new to me. Thanks for the chance to win. I need so much help getting to know my Baby Lock serger. I have had it for more years that I want to admit, took a one on one class and I am still afraid of it. I just need to make time to learn it. That will be my New Years resolution! I’ve taken several serger classes and have learned that you are really capable of doing amazing things with your serger! Mine has the wave stitch and I love it. Could certainly use a good book for more techniques. I have a Baby Lock Imagine that I really need to use for more than finishing seams. I just need a workbook or personal hands on instruction on the variety of serging stitches that I can utilize for projects! Please enter me in the contest and Thank you!! I have a serger, but haven’t done much with it so learning how to best start and end seams would be a great way to get me to jump in and begin serging. I do use my serger but mostly for finishing seams-would love to learn lots more to accomplish with it for sure! I would love to learn the decorative aspects of serging. I use it for seams, but that’s all. I know there’s more I’d love to learn to do. I haven’t been serging for long and would love to learn techniques for a more professional look. I need to know how to make a blanket stitch! I have yet to try my serger but really want to try a lettuce edge. Looking forward to watching more of Nancy’s shows. I am not very confident with my serger although I have used sewing machines for nearly 50 years now. I’ve only had my serger for 18 months and need to learn how to use it for more than just overlocking seam allowances. I would love to attain confidence in using fun threads for exposed seams. Piping is another technique I would love to become more acquinted with. My serger is a very basic model so can’t do coverstitch techniques but I am sure I could use it for a lot more than I do at the moment. I have watched the videos but find it difficult to combine videos with learning. Guess it’s because I am from a generation that learnt from books. I need refreshing on everything. I’ve not used my serger for a few years. I feel like it is starting all over again. I have a serger but it’s still in the box because I haven’t dared to use it yet so I need to learn every technique! I would like to try a 2 thread flatlock with decorative thread. I would learn other techniques from this book as well. Learning to do piping on my serger would really help me use my serger more effectively. I have a pattern for a fleece jacket with blanket stitch trim. I would love to learn how to use my serger to make this jacket. I’ve been ‘Baby-locking’ for 20 years and mastered a few creative serger techniques, but never learned some of the more decorative stitches like the pictured gorgeous wave stitch. This book would surely teach me much more so I could use my serger to its fullest capacity. Prior to reading this post I had seen a video with Pam using a serger for quilt piecing. I love my serger but haven’t explored its abilities much, so piecing quilt blocks is a technique I want to try. I would like to learn how to use my Enlighten serger to add zippers. Since I’ve only ever used my serger to finish edges and know it is capable of so much more, I’d like to learn more. In particular, the blanket stitch edge is very interesting. I finally bought a serger about a year ago, but have been a bit afraid to try it out! I’ve sewn my whole life so this shouldn’t be such a challenge, but a serger is such a different animal… how do I know when to use it? Which seams? Before, during or after construction? So , clearly, I need help, or courage, or something!?! I miss Nancy but am so grateful her legacy lives on through this blog and her videos. The wave stitch is fascinating. I have a serger that does it but have been afraid of it. I’m going to have to try it! I would LOVE to learn to do the wave stitch, and to find out just what my serger can do! I’m kind of chicken to try it on my own, so this information would truly help! Thank You! Wow, what a treasure to have a book teaching me how to do serging techniques. I surely would like to try the blanket stitch to finish off edges on a blanket and also the bias tape technique. I love my serger but there is so much I need to learn to make it my time and effort more efficient and practical. Thanks for the opportunity to be challenged! We loved Nancy but thanks for carrying on her programs. Love them! I have had my serger for 5 years and I’ve never used it. I am completely intimidated by it. It’s a simple machine with guides to thread it and I’m scared to use it. I would love to not only be confident, but be able to use it for clothing, home decor and quilting. HELP!! I really want to try the blanket stitch as a decorative trim effect. I’ve always wanted to learn to use my serger more effectively. This would help me a lot. I would love to become more familiar with my serger. The idea of doing the blanket stitch on items really intrigues me. I know there are so many things you can do with a serger, but I don’t have a clue as to where to start! I really want to know how to do it ALL! I would so enjoy this book with specific directions for making the most of my serger. I’d love to learn the correct steps for doing a cover stitch for finishing the hems of clothing. Thanks for the opportunity to win this book and DVD. I want to try the blanket stitch. Thanks! I would like to learn how to place the fabric to start the seam. Mine isn’t close nor pretty when I try to do a seam. I want to become friends with my serger and use it, not store it. Would love to use my server for more than just finished seams. I am intimidated by my server. Need help! I would love to learn how to finish the edge of napkins with my serger! I have a Baby Lock serger that does the decorative wave stitch. I would like to learn how to use it better (ie different kinds of thread), where and when. I would like to become best friends with my serger. Must admit that I am intimidated by it. Learning to do a blanket stitch with the serger could be the path to friendship and creativity! I have a great serger and a desire to be proficient with it. I have often thought that what would help me is a workbook that builds on skills. A serging curriculum. Never knew about the blanket stitch. Thx for the insight and producing a manual that is what I have been dreaming about. The technique I would like to learn is using coverstitch for encasing elastic in sportswear like bathing suits and leggings. I would love to learn to use my serger for more than overlocking seams. I would like to try the piping on a few projects that I need to make for my home. Love my BL serger!!! Would like to learn flat lock stitching and when I can use it. And so much more from Nancy……. I wish that I could use my serger more effectively. This would really help. I would like to learn the wave stitch on my serger. There are numerous techniques I would love to master using my serger, but I would love to know how to install a zipper and add piping to an item using my serger.